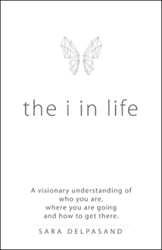 “The i in Life: A Visionary New Understanding of Who You Are, Where You Are Going, and How to Get There” (published by Archway Publishing) is a personal growth book by intercultural pedagogue Sara Delpasand. Delpasand, who specializes in working with youth, wrote the book to provide tools to help people understand how they can choose the career that achieves their goals. Sara Delpasand is a motivational speaker, educator, activist, intercultural pedagogue and certified life and career coach who has had over 15 years experience working with youth. She is currently an entrepreneur and serves as an advisor and coach in Scandinavia and the United States. She lives in Los Angeles. Delpasand can be found on Facebook and Instagram.